Area function of a Berkovich tip with 260 nm tip radius as square root of area over contact depth. In this presentation the deviation from the ideal shape can be best recognized. The agreement of results for fused silica and sapphire is excellent. For accurate measurements it is necessary to determine the area function of the indenter and to check its validity in short intervals because also diamond is wearing. The standard DIN EN ISO 14577-2 annex C distinguishes between direct and indirect calibration methods. 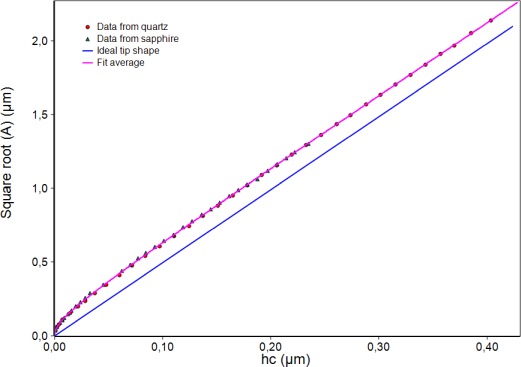 In the direct method the indenter is scanned with another instrument, mostly with an Atomic Force Microscope (AFM), and the projected area is calculated in dependence on the outermost tip. This method is not often used because another accurate instrument is necessary. In the indirect method the projected area is calculated from load-displacement measurements of a reference material with well-known modulus and Poisson's ratio. The reference material further should have a very small roughness, high homogeneity and should not show pile-up or sink-in effects. Mostly fused silica is used. The result for the area function must not be material dependent. The only possibility to check this is the measurement of another reference material with distinctly different modulus. For the ZHN sapphire single crystal is used for that. For both materials the area functions must agree. The software of the ZHN is the only one which is prepared for the use of two reference materials and their comparison. 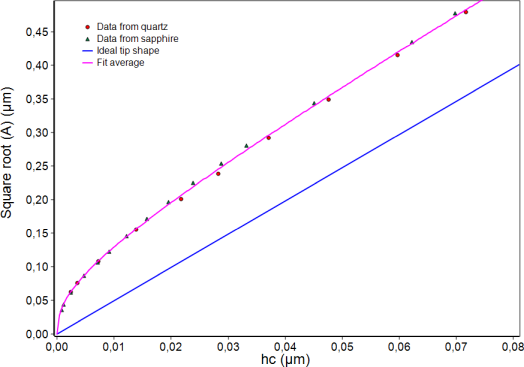 The comparison further enables the calibration of the instrument stiffness or compliance in the same procedure. Further radial displacement correction and variable epsilon factor are used by default. Detail of the Berkovich area function for the first 80 nm. The fit function is very accurate down to indentation depths of a few nanometers. 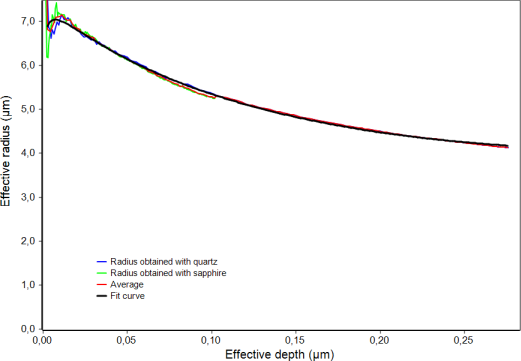 Purely elastic curves from fused silica and sapphire for the calibration of the area function of a spherical tip of nominal 5 µm radius. 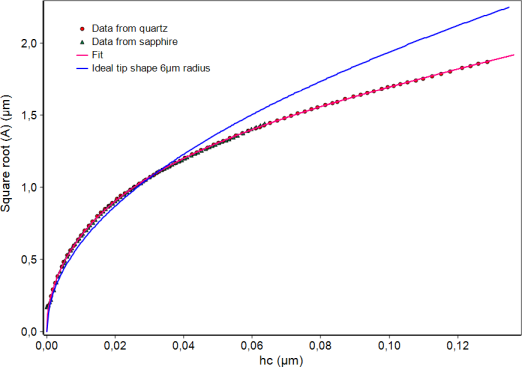 Area function for a spherical tip with data from fused silica and sapphire. The agreement is excellent. The tip is blunted at the outer end with a radius slightly larger than 6 µm. 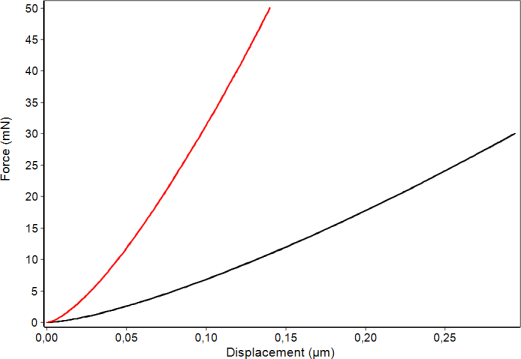 For larger depths the radius comes closer to the target value of 5 µm. Effective radius function for a spherical tip. Instead of the area such an effective radius is calculated where an ideal tip with constant radius would give the same depth (without indenter deformation). The results for fused silica and sapphire agree very well.